The classic Super Nintendo controller grows up. 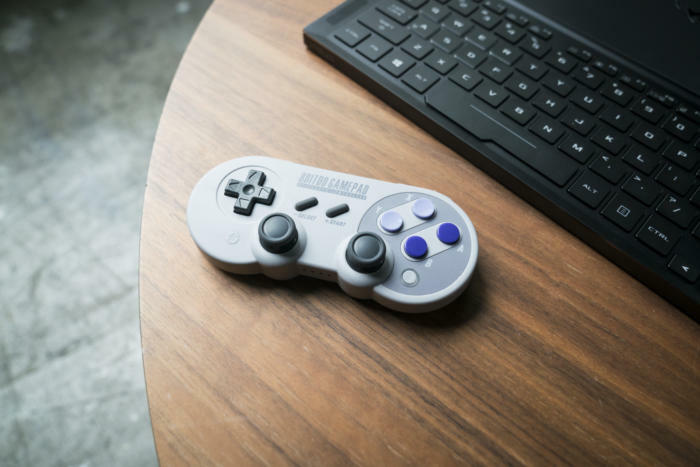 8bitdo’s SN30 Pro is the last of a long line of gaming peripherals released by this busy company in 2017. Like the N30 Pro before it, it’s a controller designed for die-hard retro fans like myself who emulate on the PC. This time 8bitdo is taking its design cues from the Super Nintendo Entertainment System, or SNES for short, one of my favorite consoles of all time. After only months of use it has already become a staple in my gaming arsenal, but it falls just short of being the perfect controller. 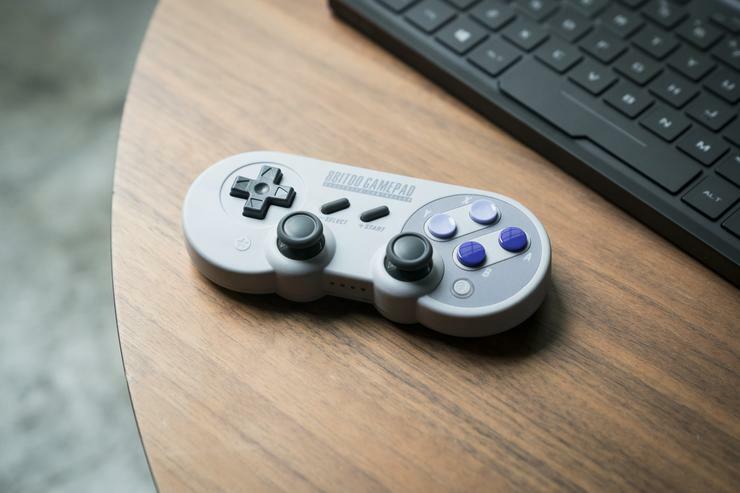 The SN30 Pro from 8bitdo looks and feels just like the classic SNES controller from the 90’s. 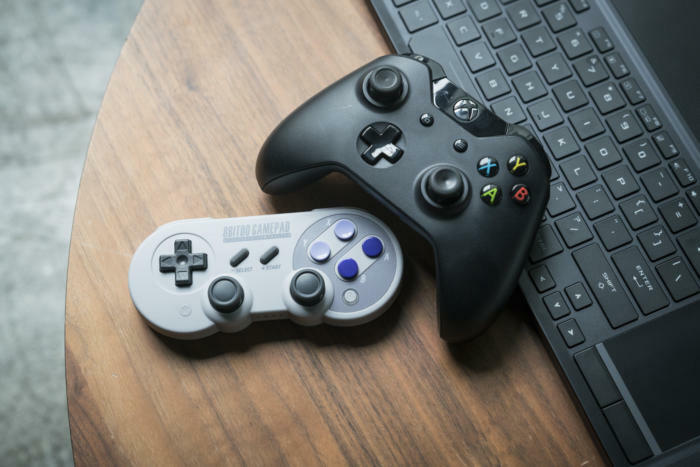 The SN30 Pro is a Bluetooth-based wireless controller that connects to your PC, Mac, Android phone, Nintendo Switch and more, and works with everything from classic games to current ones. The controller has a build in rechargeable battery that has lasted me for a few weeks on a single charge, and it connects via USB-C for charging or data transfer. The SN30 Pro also has all the buttons, sticks, and bumpers that you’d need to play current games, but I’ll get to how well they work a bit later. On the design side, 8bitdo has done a great job of using classic Nintendo design elements to charm retro game fans. The N30 Pro hearkened back to the Nintendo Entertainment System (NES) quite successfully from a design perspective but had to alter the hardware in order to add functionality. With the SN30 Pro, 8bitdo didn’t change as much of the design. 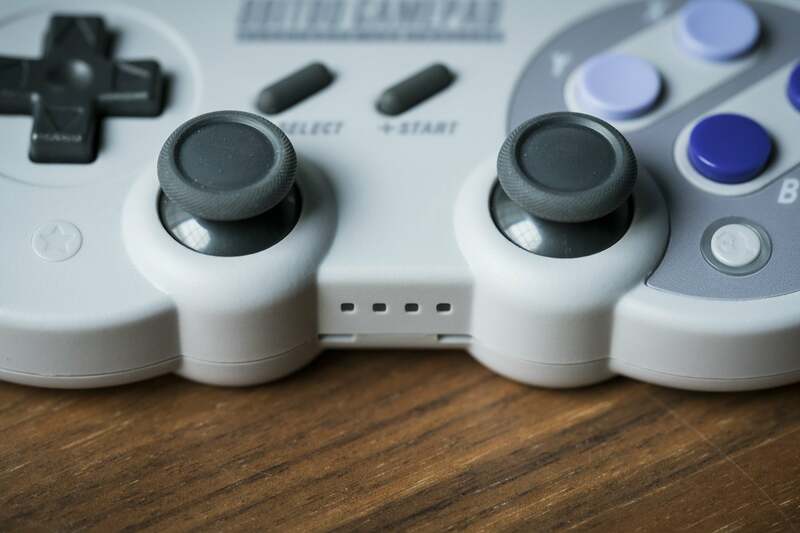 If you love the look and feel of the SNES controller, it’s all here in the SN30 Pro, and does it better than the N30 Pro. 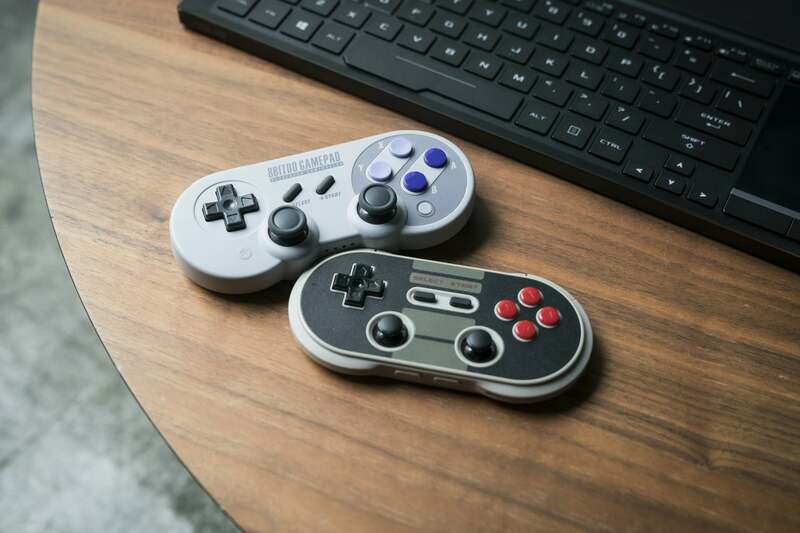 8bitdo switched to USB-C for it’s charging port and stacked bumpers. At first blush you might think the SN30 Pro is supposed to be used only with retro emulators, but it’s actually a great controller to take with you on the go and use across different scenarios. It uses controller layout standards like X-input to map out the buttons properly, depending on the platform. Setup has been streamlined a bit compared to 8bitdo’s controllers from earlier this year. Instead of telling the controller which layout (platform) to boot up with every single time, it’s only required the first time you pair. So when I sit down to play on my PC I hold down the start button + X, which boots it into the X-input layout, common for PC games. Next time I come back to play, all I have to do is hold down the start button, and the SN30 Pro remembers the last layout. Moving to another platform, such as my Switch, requires the same sequence, again, only once. Four LEDs on the front of the SN30 Pro indicate power, connection, and player number. While setup was easy, holding the SN30 Pro in my hand took some getting used to. I’m so fond of the classic SNES controller that slight deviation from muscle memory was an actual hurdle for me to get over. On the face of the controller is the usual d-pad, start, select, and face buttons, but they’ve shifted up to allow room for analog sticks and two extra buttons. Along the top edge sits four shoulder buttons instead of the classic’s two, mimicking current-day layouts of L1, R1, L2, and R2. The L2 and R2 buttons are even concave, allowing for more trigger-like pulls. Using the SN30 Pro for classic games via an emulator is one of its primary purposes, and while it’s not perfect, it comes pretty close. When working against years of muscle memory slight deviations can really mess up a flow. First off, moving all the face buttons higher isn’t a huge deal-breaker, and even in some games felt better in my larger hands. The bigger problem is the thumbsticks, which got it in the way too often. Every time I went to hit the Y button, my thumb rubbed against the side of the right thumbstick. Same goes for right on the d-pad and the left thumbstick. When hitting Start or Select I had to reach my thumbs up and over the thumbsticks—not great if you need to quickly pass the action. Like I said, these aren’t deal-breakers but annoyances that might have me reaching for the regular SN30 if it’s a SNES game I really need to be on top of. The N30 Pro is smaller than it needs to be - the SN30 Pro feels just as portable. Using the SN30 Pro for current games is a completely different matter. Here I didn't compare it to the N30 Pro that came before it, but Microsoft’s Xbox One controller, which is my de-facto controller for current games on the PC. We’ll get this out of the way now: No, it can’t compete with the full-sized, fully functional Xbox One controller. But it comes pretty damn close, and is much more portable! Using it in a game like Destiny 2 worked as intended and felt solid. So if you want a controller on your PC that aligns the thumbsticks side by side and have trouble using Sony’s PS4 controller, this is a solid option. The SN30 Pro is more portable than an Xbox One controller but is functionally equal. We'll finish it off by comparing the SN30 Pro to the N30 Pro. A more streamlined pairing system is just one of many improvements, so I'll hit the highlights here. 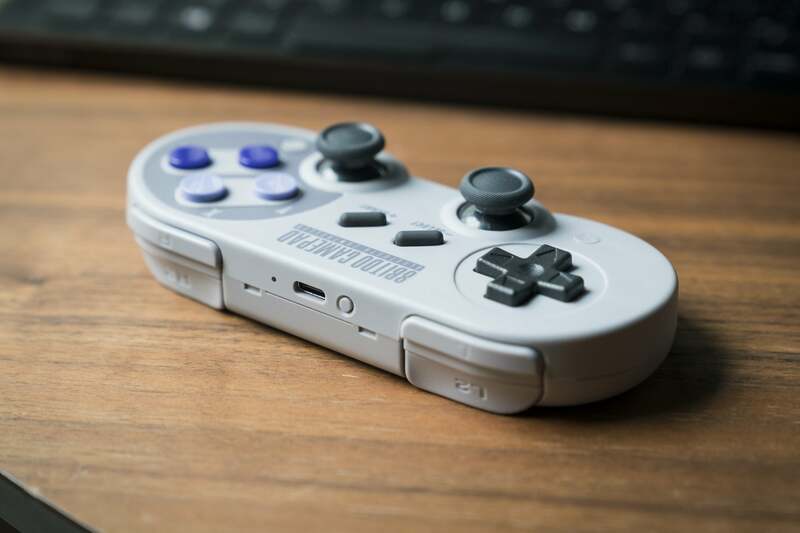 First off, 8bitdo included rumble in the SN30 Pro. The results are passable: If you hit the right frequency it can be quite loud, and the output isn’t very strong, but it’s better than not having it. Next up is the inclusion of USB-C. You can still pass power and data like the N30 Pro, but as more and more devices switch to this new format it means I'm getting closer to discarding my old micro-USB cables! The stacked bumpers on the SN30 Pro are a huge improvement over the N30 Pro’s side by side version. The most important improvements are in the overall size and layout of the buttons. 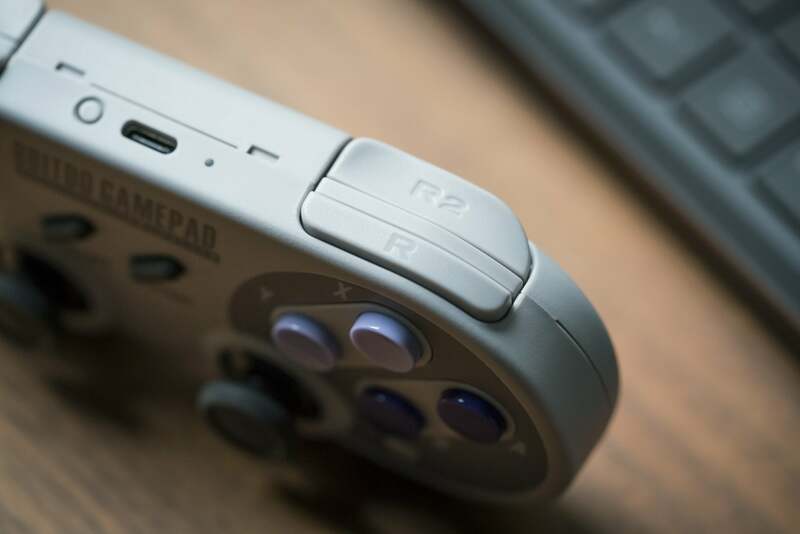 One of the reasons to spring for a controller like this is its portability, but as I noted in my N30 Pro review 8bitdo went too small and sacrificed playability. The SN30 Pro is double the size, and its battery is larger, but the package is still small enough to put in a pocket or throw into a backpack. The face buttons are larger and spaced farther apart, and the improvements to the thumbsticks and the shoulder buttons make the SN30 Pro much better all around. Like the N30 Pro, the SN30 Pro is for gamers who appreciate retro nostalgia, want contemporary functionality for current games, or are looking for a great portable option. Whether pairing it with your home PC, a gaming laptop at a friend's house, or even your Nintendo Switch, the SN30 Pro can tackle all of that in a stylish package. 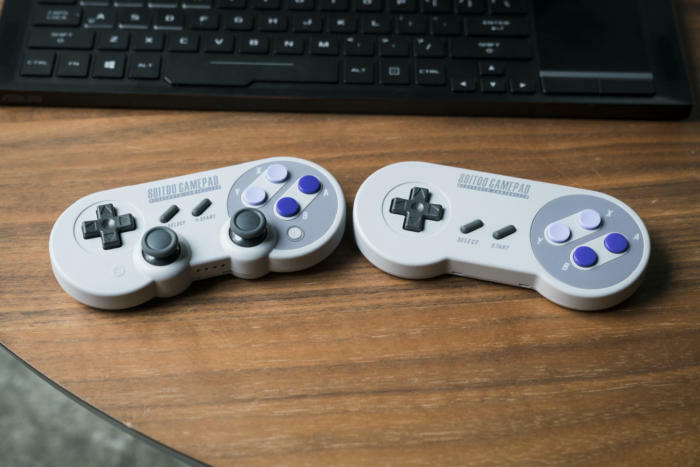 8bitdo has capitalized on the size and style of the classic Super Nintendo controller with the SN30 Pro and SN30.